I've missed Red Dwarf and even though I've been lucky enough to own the series, I've always craved more and thankfully the BBC have listened to fans and have released this special entitled Red Dwarf Back to Earth that was created specifically for TV. Although ten years has passed since Red Dwarf was last seen on TV, this comedy science fiction hasn't lost any of its charm and although the characters are older and a little pudgy, the excellent writing remains but more specifically, viewers are once again reunited with Rimmer (Chris Barrie), Lister (Craig Charles), Cat (Danny John-Jules) and Criton (Robert Llewellyn) who really get inside the heads of the characters to perfection. There is even a special appearance from a previous guest star but for those who have not seen it, I don't want to spoil it but let's just say, it's a very friendly spot. It should also be noted that this special is probably the most emotional Red Dwarf ever but let's not spoil anything for you, even though I've put in a suggestion in your head which is probably wrong. Of course for this special to work, acclaimed writer/director Doug Naylor returns to his creations and some questions and answers are answered from Season 8. The story of Red Dwarf Back to Earth is definitely a surreal experience and when a new hologram attempts to usurp the vessel of Red Dwarf, she accidentally opens up a dimensional gateway and the crew are sucked into what seems to be "our" dimension. In this world, the story of Red Dwarf is fictional and it's a popular TV series that is oozing with clichés with a great mock Blade Runner scene. Although it's set on Earth of today, they meet Craig Charles which turns the story into a metafictional experience and finally their Creator but of course, things are not what they seem and Criton always does his best to sums things up at the end for us. As ten years has passed, the special effects in the series are perfect and really help to immerse you into this story about finding yourself and of course, sticking together. 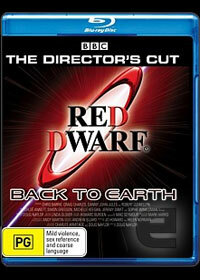 Where the DVD and Blu-ray release of Red Dwarf Back to Earth shine is through the plethora of special features that include the 70-minute "Director's Cut" which is a little different than what was currently being shown on air, making of documentary and various other titbits that make this a blessing from the Creator of Red Dwarf which was quite exceptional. Of course my two favourite parts of this special was the cast commentary as it's great hearing the gang have fun and ham it up as they chat, laugh and reminisce plus the great Smeg Ups featurettes that is definitely one of the most amusing Red Dwarf experiences to date. The video quality on DVD is quite impressive with exceptional images, colours and deep black levels. However, where it does shine is through the Blu-ray version which looks quite stunning and detailed as you virtually see every pore on the actor's faces that left me quite flabbergasted and dare I say, this is easily one of the best Blu-ray discs that I have seen all year. At the end of the day, Red Dwarf Back to Earth is a must have DVD or Blu-ray for fans of this series that I recommend above all purchases for this month. A great story, brilliant acting and a classic Red Dwarf story that will have you clamouring for more and more.